Whether you have an existing tea program to revive or need to create a new tea program, Firsd Tea offers high quality leaf, and award-winning blends to help your business respond to the rising expectations of new and veteran tea drinkers. 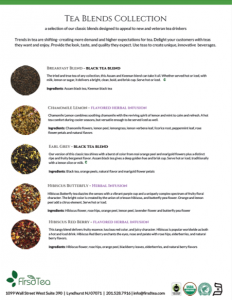 We invite you to explore our TEA PROGRAM and sample our TEA BLENDS. Tea drinking tends to increase in the latter half of the day, as THIS National Coffee Association research reveals. Younger consumers are as likely to drink tea as coffee, and they are more likely to prefer premium or specialty coffees and teas, including herbal teas and teas with functional (health) benefits. As covered HERE, mainstream coffee retailers are improving their tea menus with a more premium selection of teas. Trends like MATCHA attract new tea drinkers and create new taste experiences (like matcha lattes), new drink formats, and new benefits. 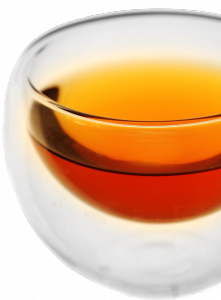 Tea programs give you the teas you need to create a selection of beverage options, including iced teas, tea lattes, and mocktails. Don’t forget the many CULINARY USES OF MATCHA. View our new and classic blends HERE, including Peach Mango Green, Chamomile Lemon, and our award-winning Earl Grey. Download an introduction to our tea program HERE.